HERE WE HAVE A FUEL PUMP, FITS AUSTIN MAESTRO 1.3, 03/1983-09/1992. MAESTRO VAN 1.3, 01/1986-09/1982. ROVER MAESTRO 1.3, 10/1990-10/1994. HERE WE HAVE A FUEL PUMP, ROVER PRINCESS 2.2 MANUAL 1975-1981. ROVER 420 GTi 2.0 Fuel Pump 92 to 95 20M4F QH WFX10033. ROVER WFX10033. ROVER/TRIUMPH/AUSTIN WFX10033. ROVER 400 (XW) 420 GTI/GSI/Vitesse Saloon Petrol 02/1992 04/1995 FWD 16 140 103. Function Fuel Pump. Fuel Pump fits ROVER MINI 1.0 92 to 93 99HD81 QH. AUSTIN 1000-Series MK II 1100 Special Design Petrol 01/1970 12/1974 FWD 8 44 32. AUSTIN 1000-Series MK II 1300 Special Design Petrol 01/1970 12/1974 FWD 8 53 39. TRIUMPH SPITFIRE Mk4 1.3 Fuel Pump 71 to 72 FM3 QH. TRIUMPH SPITFIRE 1.3 MK III Convertible Petrol 12/1967 12/1970 RWD 8 75 55. TRIUMPH SPITFIRE 1.3 MK IV Convertible Petrol 01/1971 12/1972 RWD 8 76 55. LAND ROVER 88/109 2.3D Fuel Pump 63 to 86 QH 536146. LAND ROVER 536146. ROVER 563146, ETC4304. Function Fuel Pump. Applicable Vehicles. QFP267 / FP622. To Fit AUSTIN ROVER MAESTRO. WITH 2 GASKETS. ROVER RKC1624, RKC3447. ROVER/TRIUMPH/AUSTIN RKC1624, RKC3447. TRIUMPH DOLOMITE 1300 Saloon Petrol 01/1977 12/1981 RWD 8 59 43. TRIUMPH DOLOMITE 1500 HL Saloon Petrol 01/1977 12/1981 RWD 8 72 53. TRIUMPH 1500 1.5 Saloon Petrol 10/1970 12/1974 RWD 8 57 42. ROVER AUF705, AUF706, AUF812, AZX1806, AZX1817, AZX1818. ROVER/TRIUMPH/AUSTIN AUF705, AUF706, AUF812, AZX1806, AZX1817, AZX1818. AUSTIN 1000-Series MK II 1100 Special Design Petrol 01/1970 12/1974 FWD 8 44 32. LAND ROVER DEFENDER L316 2.5D Fuel Pump 90 to 01 QH ERR5057. LAND ROVER ERR5057. Function Fuel Pump. Model year to: 09/1995. 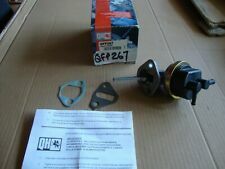 Fuel Pump QFP703 Quinton Hazell. Part Number QFP703. ROVER WFX10033. ROVER/TRIUMPH/AUSTIN WFX10033. ROVER 400 (XW) 420 GTI/GSI/Vitesse Saloon Petrol 02/1992 04/1995 FWD 16 140 103. Function Fuel Pump. Austin Maestro, Maestro Van, Montego. MG Maestro, Montego. Maestro 1.6 03/1984 – 10/94. Maestro Van 1.6 01/1986 – 09/92. Montego 1.6 04/1984 – 11/88. Mini, Cooper & Moke, Montego, Princess. MG Rover models. ROVER 45 RT 2.0 Fuel Pump 00 to 05 20K4F QH. ROVER 400 Tourer (XW) 1.6 i Estate Petrol 05/1994 11/1998 FWD 16 112 82. CITROËN BERLINGO / BERLINGO FIRST Box (M_) 1.4 i (MBKFX, MBKFW) Box Petrol 07/1996 12/2011 FWD 8 75 55. ROVER 563146, ETC4304. ROVER/TRIUMPH/AUSTIN 563146, ETC4304. Fuel Pump QFP135 Quinton Hazell. Part Number QFP135. LAND ROVER 536146. Function Fuel Pump. FIRST LINE FFP 313. Applicable Vehicles. Austin Maestro, Maestro Van, Montego. Maestro 1.3 03/1983 – 10/94. Maestro Van 1.3 01/1986 – 09/92. Montego 1.3 04/1984 – 11/88. Mini, Cooper & Moke, Montego, Princess. Austin Rover models. Daimler Double Six, Limousine, Sovereign. ROVER RKC5051, TKC3419. ROVER/TRIUMPH/AUSTIN RKC5051, TKC3419. TRIUMPH DOLOMITE 1850 Saloon Petrol 01/1972 12/1977 RWD 8 92 68. TRIUMPH DOLOMITE 1850 HL Saloon Petrol 01/1977 12/1981 RWD 8 92 68. TRIUMPH DOLOMITE 2.0 Saloon Petrol 03/1976 01/1980 RWD 16 127 93. Austin Maestro 1.6 (R Series) 10/82 - 10/84. ROVER ERJ197, WFX100631, WFX10631. ROVER/TRIUMPH/AUSTIN ERJ197, WFX100631. WALBRO ERJ197. ROVER 400 Tourer (XW) 1.6 i Estate Petrol 05/1994 11/1998 FWD 16 112 82. ROVER 400 Hatchback (RT) 414 Si Hatchback Petrol 05/1995 03/2000 FWD 16 103 76. QUINTON HAZELL. 50 16593 24504 4. ROVER RKC1624, RKC3447. ROVER/TRIUMPH/AUSTIN RKC1624, RKC3447. Fuel Pump QFP119 Quinton Hazell. Part Number QFP119. MG MIDGET 1.5 Convertible Petrol 09/1974 12/1979 RWD 8 66 49. TRIUMPH 1500 1.5 Saloon Petrol 10/1970 12/1974 RWD 8 57 42. QH QFP1 Fuel Pump For ROVER MG Maestro 1.6 1982-1984. 1982>1984 MG Maestro 1.6. This Fuel Pump is ONLY Suitable for the. We have a vast knowledge of car spares at Wilco Direct. serving the public for over 50 years. RANGE ROVER Mk2 P38A 2.5D Fuel Pump 94 to 95 QH ERR5057. LAND ROVER ERR5057. Function Fuel Pump. Model year to: 09/1995. 50 16593 14110 0. QUINTON HAZELL. 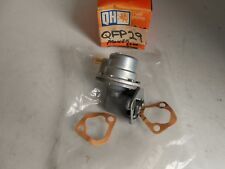 QH QFP124 FUEL PUMP AUSTIN ROVER MAESTRO & MONTEGO. 50 16593 14110 0. QUINTON HAZELL. ROVER ERJ197, WFX100631, WFX10631. ROVER/TRIUMPH/AUSTIN ERJ197, WFX100631. WALBRO ERJ197. ROVER 400 Tourer (XW) 1.6 i Estate Petrol 05/1994 11/1998 FWD 16 112 82. CITROËN BERLINGO / BERLINGO FIRST Box (M_) 1.4 i (MBKFX, MBKFW) Box Petrol 07/1996 12/2011 FWD 8 75 55. RANGE ROVER 2.5D Fuel Pump 91 to 94 14L QH ERR5057. LAND ROVER ERR5057. Function Fuel Pump. Model year to: 09/1995. LAND ROVER DISCOVERY LJ 2.5D Fuel Pump 89 to 98 QH ERR5057. LAND ROVER ERR5057. Function Fuel Pump. Model year to: 09/1995. TRIUMPH TR7 2.0 Fuel Pump 78 to 81 CG2 QH. TRIUMPH DOLOMITE 1850 Saloon Petrol 01/1972 12/1977 RWD 8 92 68. TRIUMPH DOLOMITE 1850 HL Saloon Petrol 01/1977 12/1981 RWD 8 92 68. TRIUMPH DOLOMITE 2.0 Saloon Petrol 03/1976 01/1980 RWD 16 127 93. ROVER ERJ197, WFX100631, WFX10631. ROVER/TRIUMPH/AUSTIN ERJ197, WFX100631. WALBRO ERJ197. Model year from: 01/1990; Engine Code: 14K4D. ROVER 400 Tourer (XW) 1.6 i Estate Petrol 05/1994 11/1998 FWD 16 112 82. ROVER RKC5051, TKC3419. ROVER/TRIUMPH/AUSTIN RKC5051, TKC3419. Fuel Pump QFP33 Quinton Hazell. Part Number QFP33. TRIUMPH DOLOMITE 1850 Saloon Petrol 01/1972 12/1977 RWD 8 92 68. TRIUMPH DOLOMITE 1850 HL Saloon Petrol 01/1977 12/1981 RWD 8 92 68. Fuel Pump QFP169E Quinton Hazell. Part Number QFP169E. ROVER AUA66. ROVER/TRIUMPH/AUSTIN AUA66. MORRIS MINOR Convertible 1.1 Convertible Petrol 01/1962 08/1969 RWD 8 50 37. MORRIS MINOR Estate 1.1 Estate Petrol 01/1962 10/1971 RWD 8 50 37. 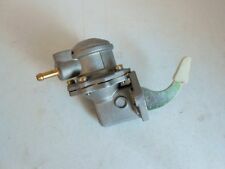 TRIUMPH SPITFIRE Mk4 1.5 Fuel Pump 72 to 75 QH. TRIUMPH SPITFIRE 1.5 MK IV Convertible Petrol 12/1972 12/1975 RWD 8 69 51. TRIUMPH SPITFIRE 1500 Convertible Petrol 01/1975 01/1980 RWD 8 69 51. TRIUMPH 1500 1.5 Saloon Petrol 10/1970 12/1974 RWD 8 57 42. ROVER ERJ197, WFX100631, WFX10631. ROVER/TRIUMPH/AUSTIN ERJ197, WFX100631. WALBRO ERJ197. RENAULT ESPACE Mk III (JE0_) 2.0 MPV Petrol 09/2001 10/2002 FWD 16 139 102. RENAULT ESPACE Mk III (JE0_) 2.0 (JE0A) MPV Petrol 11/1996 10/2000 FWD 8 114 84. ROVER ERJ197, WFX100631, WFX10631. ROVER/TRIUMPH/AUSTIN ERJ197, WFX100631. WALBRO ERJ197. ROVER 400 Tourer (XW) 1.6 i Estate Petrol 05/1994 11/1998 FWD 16 112 82. ROVER 400 Hatchback (RT) 416 Si Hatchback Petrol 05/1995 03/2000 FWD 16 112 82. ROVER RKC1624, RKC3447. ROVER/TRIUMPH/AUSTIN RKC1624, RKC3447. TRIUMPH SPITFIRE 1.5 MK IV Convertible Petrol 12/1972 12/1975 RWD 8 69 51. TRIUMPH SPITFIRE 1500 Convertible Petrol 01/1975 01/1980 RWD 8 69 51. We buy direct from Quinton Hazell, Firstline, Gates and Borg and Beck making us Midlothian's only authorised dealer of Quinton Hazell parts. Manufactured by QH (Quinton Hazell). Mini - 848cc, 998cc, 1275cc - from 1969 to 1992. TRIUMPH HERALD 1.3 Fuel Pump 67 to 71 QH 208493 208502. ROVER 208493, 208502. ROVER/TRIUMPH/AUSTIN 208493, 208502. TRIUMPH HERALD 1200 Saloon Petrol 01/1967 12/1968 RWD 8 62 46. TRIUMPH HERALD 13/60 Saloon Petrol 01/1967 12/1971 RWD 8 62 46. TRIUMPH DOLOMITE 2.0 Fuel Pump 73 to 81 QH RKC5051 TKC3419. ROVER RKC5051, TKC3419. ROVER/TRIUMPH/AUSTIN RKC5051, TKC3419. TRIUMPH DOLOMITE 1850 Saloon Petrol 01/1972 12/1977 RWD 8 92 68. TRIUMPH DOLOMITE 1850 HL Saloon Petrol 01/1977 12/1981 RWD 8 92 68. ROVER ERJ197, WFX100631, WFX10631. ROVER/TRIUMPH/AUSTIN ERJ197, WFX100631. WALBRO ERJ197. CITROËN/PEUGEOT 152546, 152552, 152560, 152575, 152594. PEUGEOT 406 Coupe (8C) 2.0 16V Coupe Petrol 03/1997 12/2004 FWD 16 132 97.